The entire "Barney Miller" series on box set comes out today, and it includes the first season of "Fish," which I watched regularly even though I think it was probably terrible. 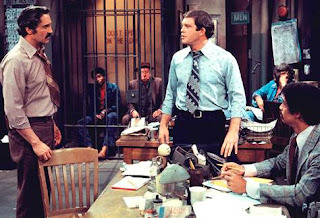 I wrote an appreciation of the main "Barney Miller" characters for MSNBC and TODAY.com. I think Wojo was always my favorite, but I still kind of have a crush on Hal Linden. So calm, so debonair, so unshakable. "Barney Miller" really should be in our book. It was such a Seventies classic. So New York, so kind of grubby. None of the detectives looked like the glamour pusses who fill out police dramas today. And Abe Vigoda! Tessio! He played Fish like a 100-year-old guy back then, and yet he's still alive today at 90. Were you a "Barney Miller" fan? Which character was your favorite? When I was little, my dad and I would watch Barney Miller reruns often. He loved Nick Yemana, and I loved Harris & Wojo. The criminals were hilarious as well. The man who thought he was a werewolf? Classic. My favorite character was the bass player on the them song. After him, I like smartass Dietrich. Ron Glass (I can't remember his character's name) was my favorite with Dietrich next followed by Wojo. I watched it when I was really little, so I'm surprised I even remember them. It was a great show. I remember finding out Max whatever who played Wojo wore a hairpiece on the show because when he was on Wiz Kids (was that the name? Albert from Little House as a hacker?) he was bald on top with long hair in back. Deitrich, hands down. Steve Landesberg was drier than a great martini. "Well, we can rule out the wind..." is a classic. I actually didn't like Wojciehowicz that much, because I thought the writers relied a little too heavily on the stereotype of Polish people being unintelligent (even though I'm not Polish myself). My favorite character on the show was definitely Dietrich (Steve Landesberg) followed closely by Harris (Ron Glass) and Yemana (Jack Soo). I also liked Inspector Luger whenever he showed up.